Many disinfectants, which claim proper efficacy against many pathogens, are often tested at ideal circumstances, meaning room temperature (25 degrees C), clean surfaces with no dirt and mostly against one single type of microbe. Not everybody knows how low temperatures negatively affect the action of certain disinfectants. Some disinfectants may lose half their efficacy after only 10 degrees difference! This is a serious issue in colder climates and colder seasons. It concerns for example most of Europe, North Asia, North America and parts of South America. To compensate for any loss of efficacy under colder conditions, typically the dosage of the disinfectant should increase. When, for example, using a popular quat/aldehyde combination, in order to have the same killing effect on pathogens, at 4oC at least a 4 times higher concentration should be applied compared to the same situation at 25oC. In a test performed at different temperatures the killing effect of an aldehyde disinfectant against E. faecium was compared at 20oC, 10°C and 0oC. In the table (+, green) means the disinfectant could achieve a log 5 (100,000x) pathogen reduction, generally seen as an acceptable level. When it says (-, red) in the table, the disinfectant did not succeed. From the table it can be concluded the E. faecium could be neutralised at 20oC with only 1 per cent of this disinfectant, but at 10oC and 0oC this concentration did not give a satisfactory reduction. At 0oC even 8.0 per cent of disinfectant could not reduce the pathogen to the required level. When the activity of a disinfectant is greatly reduced at low temperatures, this is called ‘low temperature fault’ or in German: ‘Kaltefehler’. Other than aldehydes such as formaldehyde and glutaraldehydes also quats and combination products are known to suffer from efficacy decrease upon temperature loss. In general, chemical processes are slowed down due to a decrease in temperature. As a rule of thumb, the reaction rate halves each 10°C of temperature decrease. Yet as shown in the table with chemical disinfectants there is a great difference in behaviour upon temperature decrease. Where at 20oC nearly all disinfectants perform as desired, the efficacy of some goes down rapidly at 10°C and might be lost completely at 0oC. Disinfectants can be split into roughly 2 groups when it comes to efficacy loss at low temperatures. The disinfection mechanism of aldehydes is best described by inhibition through polymerisation or gelation of the membrane of the microbe. This process, chemically named condensation is typically dependent on the mobility of both microbe and disinfectant. In below reaction equation this gelation of the membrane with formaldehyde (O=CH2) is taken as example. This reaction is irreversible. The reaction depends much on the collision rate of both protein and aldehyde which is decreased rapidly with decreasing temperature. Hence efficacy goes down. 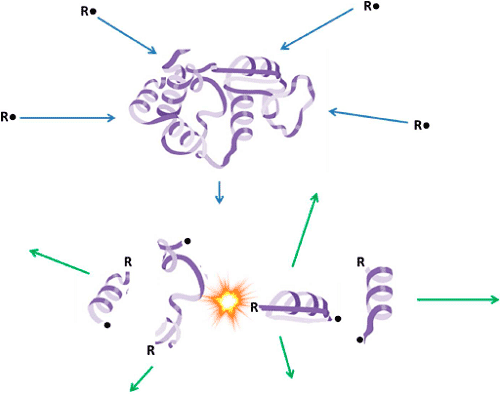 In the case of quats the mechanism is based on denaturation (disentanglement) of the protein shell of the microbe as shown in below picture. 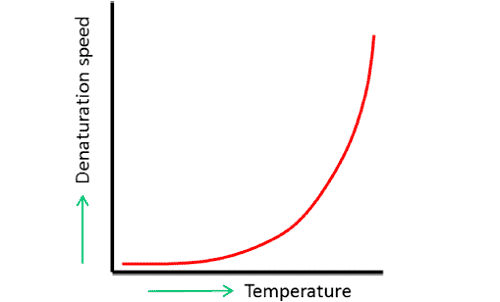 Disentanglement of protein is very much mobility related and logarithmic dependent on the temperature as shown in the graph below. Especially the first degrees of temperature loss have a big effect on the denaturation speed caused by the quat-based disinfectant. Hence the efficacy of quat-based disinfectants is also severely affected by temperature. From a chemical point of view it is known the rate of radical-ion reactions are least susceptible upon temperature loss. The oxidation or burning of the cell is an autonomous reaction which is constantly fuelled by the creation of new radicals and ions independent of the temperature. In the picture below it is shown, how the radicals from the disinfectant breakup the protein inside the membrane of the microbe. Peroxygens, perchlorates and Halamid® can therefore be used during warm and cold conditions and hardly show any decrease in reaction rate upon temperature decrease. It is clear peroxygens (like hydrogen peroxide) and perchlorates are ultra-fast radical generators. This is good for fast action and rapid breakdown of the microbes, which is hardly dependent on temperature. The downside of this reactivity is that the large amount of radicals react not only with microbes but also with organic matter (dirt). A lot of activity is lost by these side effects. Halamid® does the generation of radicals in a more controlled way, acting more selectively at a constant but lower rate, also independent of temperature. It is especially effective on microbial material and leaves metal and plastic surfaces untouched. Moreover, Halamid® is mild for the animals and safe to workers that are exposed to disinfectants. In conclusion, low temperature defaults of aldehyde and quaternary based disinfectants are known to be problematic and may give rise to incomplete disinfection at low temperatures below 10oC. Oxidising disinfectants do not suffer from this temperature effect but may be inactivated by organic matter. Halamid® is the right compromise and would be best suited for cold temperature conditions being effective and selective in killing pathogens.